Haelfinan (ALE-fin-non) are very rare, appearing only in small pockets in the deep forests and distant islands in the World of San'Dora. Haelfinan have a dire sensitivity to ferrous metal including steel, which encourages them to avoid proximity to the races of Var and Men, who favor Iron based equipment. Smaller than Haelfinan that bear some Human ancestry, Haelfinan are also superbly graceful and exquisitely beautiful as a rule. Haelfinan have sharp senses and are naturally talented at archery. They also have the propensity for the kind of magic known as Aeldenaren coursing through their very veins. Though not all Haelfinan chose to pursue their Aeldenaren gifts to their fullest potential, it is the rare pureblooded Haelfinan that doesn't have at least a few Aeldenaren abilities. Haelfinan users of Aeldenaren are known as Willcrafters, and hold great authority among the Haelfinan. Only a pureblooded Haelfinan is able to have all of the Aeldenaren Gifts. Pureblooded Haelfinan are generally slim and well formed. They range between 5' and 5' 8", and weigh between 120 and 150 lbs. Their skin is typically pale; in some extreme cases their skin tone can even be so pale as to appear to be alabaster white. Their hair is usually gold, copper, silver, or jet black. Their eyes are most often blue or green, but some have silvery grey or purplish eyes, either of which is a trait particularly associated with powerful Willcrafters. In addition to their long pointy ears, Haelfinan have sharp features with high cheekbones, a tapered jaw culminating in a pointy chin, and arched eyebrows. Haelfinan grow hair only on their heads, and do not have facial hair other than their eyebrows; most Haelfinan have a marked "widow's peak" and tend to wear their hair long. Haelfinan generally are described as looking stern and haughty by those Humans that have had contact with them. The Haelfinan still living on the mainland usually wear simple but well made clothes that are camouflaged to their individual environments. 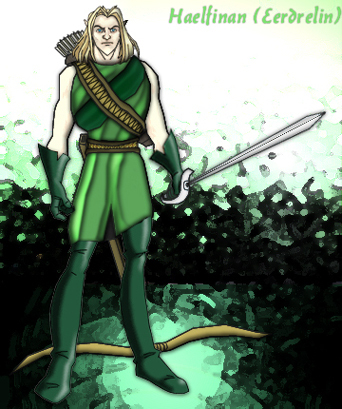 The Haelfinan of Aelora favor leathers and dark green cloaks; they generally tend to have copper hair and green eyes, but a minority of them have jet black or blonde hair. The Haelfinan of Eerdrelin favor thick green tunics over leathers colored dark green by Willcrafting; they generally are blonde and blue eyed but with a minority that have copper hair and green eyes. 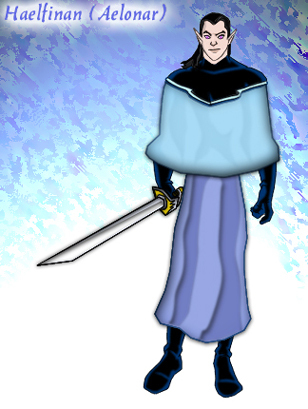 The Haelfinan of Aelonar tend towards comfortable but thick robes, of all different colors as they like (but with a tendency towards blue and silver). Their hair is usually silver or black, and their eyes run the gamut of Haelfinan shades, but there is a heavy prevalence of Willcrafters and many of them have silver or indigo eyes. The Haelfinan of Eeandrial and Llishima dress and look similarly to the Haelfinan of Aelonar, but their robes are lighter; some wear pastel colors. The Haelfinan of Eeandrial do favor crimson and gold, and those of Llishima favor purple and gold; their respective colors. Most citizens wear elaborate and ornate jewelry of impressive manufacture, and in fact Llishima exports some such items for great profit. Many Haelfinan prefer to go unarmed, but those that do arm themselves favor long slim blades made from Blaenarianodd (Haelfsilver), typically with hand-guards, and / or bows. Pureblooded Haelfinan are mercurial, inscrutable, and prone to extremes, but at the same time they are subtle. They also tend to have a strange way of looking at things that shorter lived races lack the perspective to truly understand. Often times a Haelfinan will do things that are incomprehensible to non-Haelfinan out of nothing more than a sense of boredom. They also have a tendency to become obsessed or fascinated with various things that catch their fancy for decades at a stretch. Perhaps the most marked thing about Haelfinan from a Human perspective is their propensity for extremely strong and pure emotions. They are capable of loves, hates, compassions, and desires so strong that Humans are rarely capable of matching them. Very little is known of the Haelfinan by outsiders, due to their generally xenophobic behavior. However a few groups of note have contact with non-Haelfinan, mostly Humans. A militant group of Haelfinan among the Eerdrelin are called the Nuwynamadd Caleb (nu-we-NOM-ath CAW-leb; literally "Vengeance Hunt"). They constantly fight against their Nordmanner neighbors, resisting any incursions (real or perceived) into their lands. Aside from being a dedicated band of Aeldenaren warriors and terrifyingly accurate archers, they also are responsible for the creation of the Tarbhdynion (tarv-DEEN-eon; beast men), which they use as foot troops in their endless war. Visitors that brave the ports of Eeandrial find their every move watched and their movements restricted by the Almarach Freycaedyn (awl-MORE-rach fray-CAY-deen), crimson and gold clad armed guards. Though it is not generally known, this is in fact the only equivalent to a standing military for the nation of Eeandrial (save an equivalently sized naval force), and though it is a relatively small force to represent the entire military presence of a nation as it numbers less than a thousand each member is an accomplished swordsman. Similarly the open port near the capital of Llishima, Tabhdach (HOV-dock) is protected by a force of several hundred Fendylagh (fen-DEAL-og) in their fancy purple and gold tabards and Haelf-silver armor. To gain entry into this organization, a Haelfinan must be a recognized blademaster; additionally one must be adept at using Aeldenaren powers in a "practical" fashion (i.e. in a fashion useful in combat). Each member of this extremely elite group is likely worth a platoon of ordinary Human soldiers. 8 Aeldenari Gifts: Choose 8 different Gifts. You may not choose more Advanced Gifts than your character has Basic Gifts.